This ice cream was a challenge. 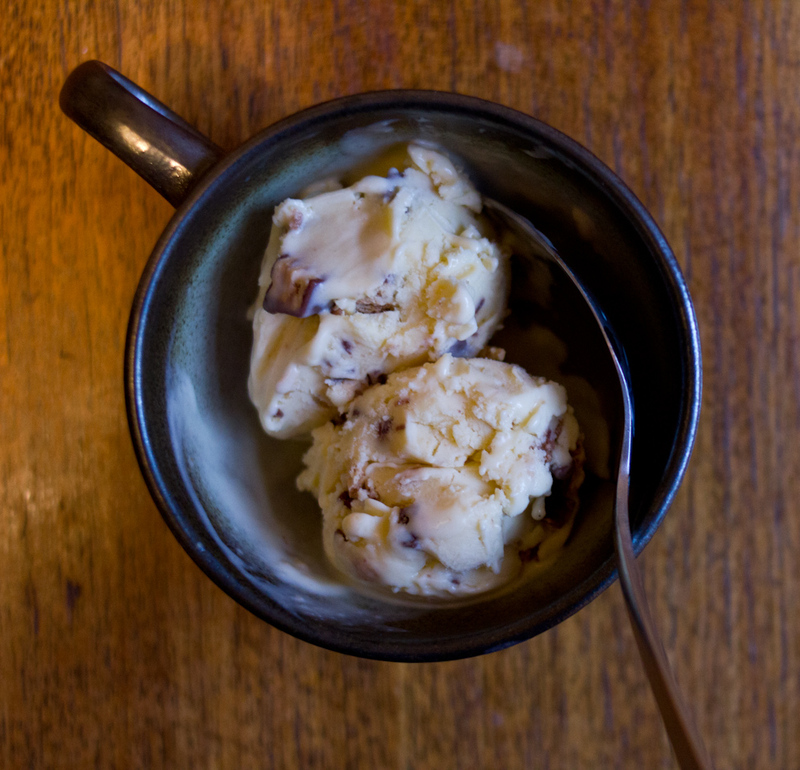 Not because making ice cream from scratch is a difficult thing—I’ve made it many times before with success. But because sometimes I loose my head at the grocery store, throw reason out the window and buy something as a ‘substitute’ that should never, never be used as a substitute. 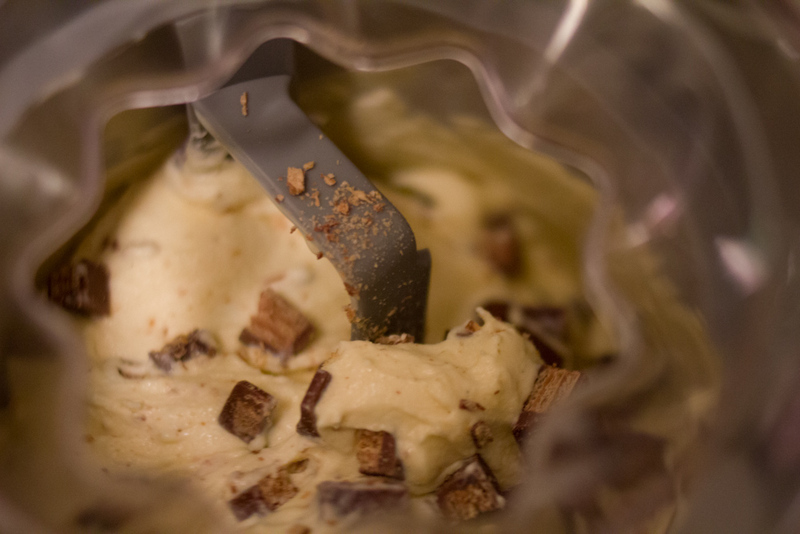 It was a Tuesday night and I was making ice cream for our supper club later in the week. We were responsible for dessert and I’d brainstormed a glorious candy-filled concoction. I figured I’d make the custard quickly before Jordan got home from work and we sat down to dinner. I was already feeling a bit on edge before I began this culinary project, but like I’ve mentioned before, there is nothing like cooking to help me find my center. Except when a crucial error in judgment sends the whole thing into a sticky, custardy, teary tailspin. You can probably guess which ensued that fateful Tuesday. Dear readers, Ovaltine, though technically a malted milk beverage, is NOT malted milk powder. Don’t let any discussion forum or milk wiki on the internet convince you otherwise. And don’t try and talk yourself into it after you’ve already been to four grocery stores and not one of them sold true malted milk powder. Let me just say it again: Ovaltine is not a viable substitute for malted milk, in any cooking context. Thankfully, Jordan got home just as I was warming the milk and cream to add to my eggy-Ovaltine blend of poor decision making and pulled the emergency break on this disaster. This is how it went down. J: Why are those eggs so brown? I thought malted milk was white? How much did you use? E: I … I … I went to four grocery stores. I couldn’t find malted milk powder ANYWHERE. I even went up to the market all way up the hill. I was there forever trying to find it. So looked it up online to see if I could substitute something. Some internet people say you can substitute Ovaltine. It’s probably fine ……………(panic)……………… It’s probably horrible. I’m such an idiot. I just ruined five eggs. Five beautiful eggs. They were from our CSA, you know. And now we’re out of eggs. And the city of San Francisco still won’t offer up any malted milk powder. (Collapse in heap on kitchen floor). J: Well, before you add the milk, did you even taste it? J: Sutter Fine Foods has malted milk powder. Let me show you. E: (Grumble, sniff, grab purse). And so we walked down to the corner store on our block, Jordan led me to the baking section, grabbed a container of Carnation Malted Milk Powder from the top shelf and beamed. I may have muttered something about how this was the most damn annoying ice cream that I’ll ever make, paid the cashier, and scampered up the stairs to correct my mistakes of earlier in the evening. With actual Carnation malted milk powder instead of Ovaltine, my custard was a beautiful pale yellow, and the final ice cream was delicious. There is nothing like the combination of malted milk, vanilla and kit kat to make a person forget the trials that led them to that delicious end. And, if you heed my advice and don’t get lured to the Ovaline dark side, you too can enjoy a perfect ice cream without the drama. In a medium bowl, whisk the egg yolks. Add the malted milk powder and whisk together. In a saucepan over medium heat, warm the cream, milk, sugar and salt together. Bring just to a simmer. Whisk about 1/2 cup of the milk mixture into the egg yolks, pouring the hot milk slowly into the eggs to temper them. Add another 1/2 cup of milk into the eggs. Then pour the egg mixture back into the saucepan with the rest of the milk. Put a mesh strainer over a medium sized bowl or tupperware. Fill a large bowl with ice and water. Over medium heat, stir the milk and egg mixture until it begins to thicken. 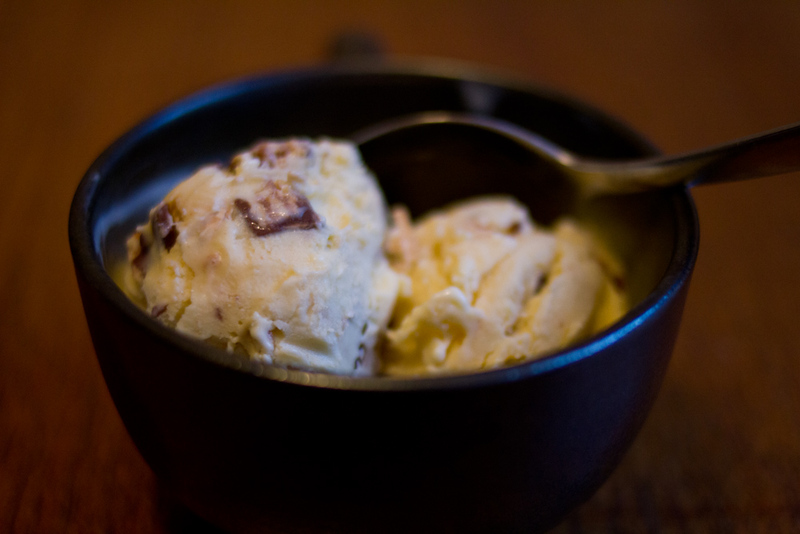 When the ice cream base could coat a spoon, pour it through a mesh strainer into a bowl or tupperware. Cool the base in the ice water bath, stirring occasionally. Refrigerate the base overnight. The next day, add the vanilla to the ice cream base. 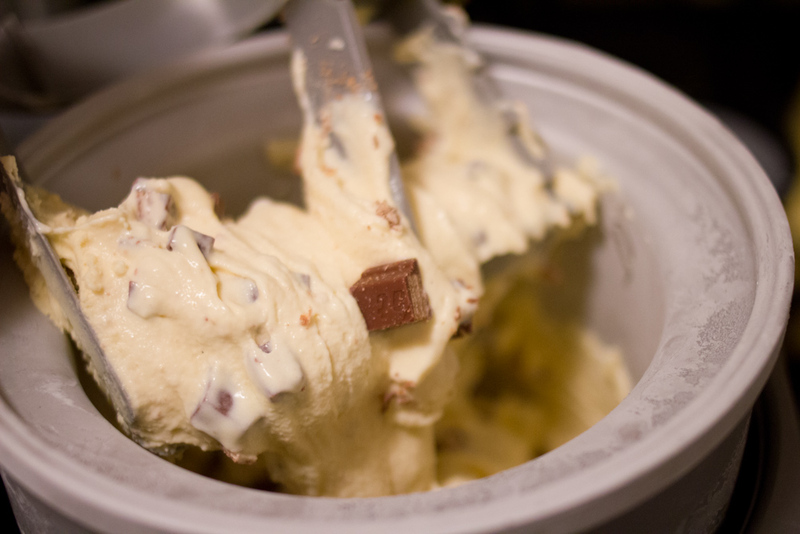 Pour it into your ice cream maker and freeze according to your maker’s instructions. 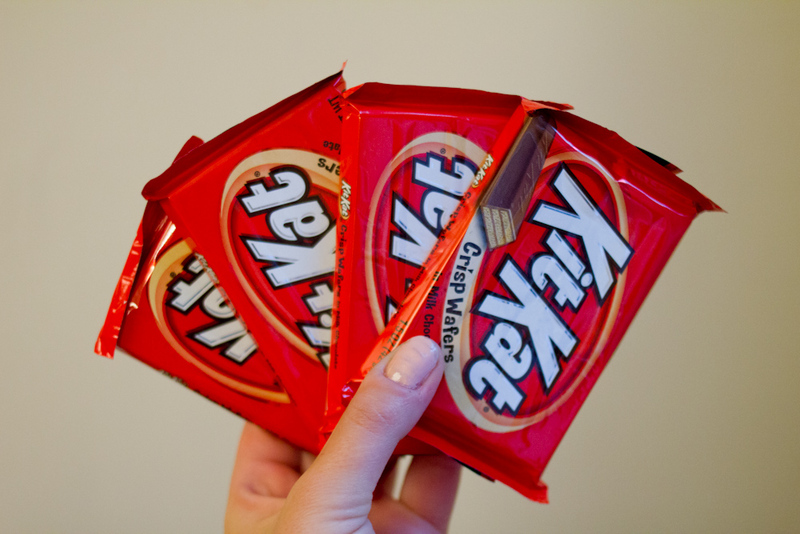 Meanwhile, chop up the kit kats. 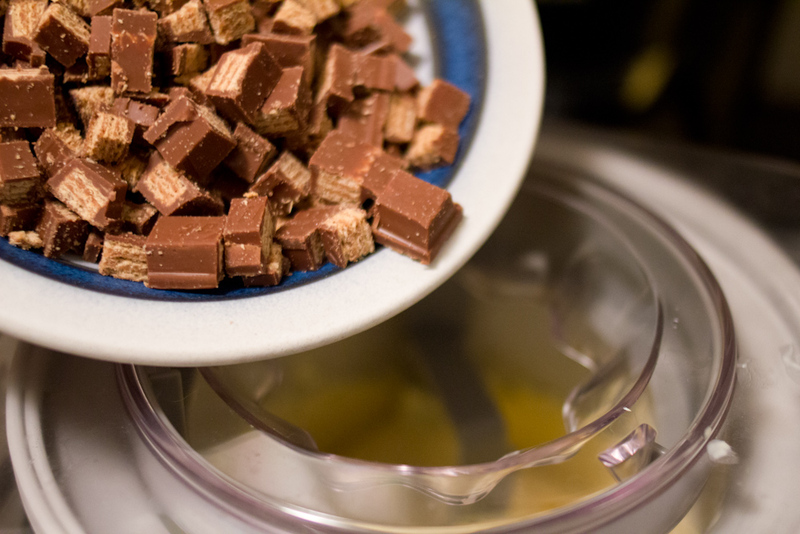 When the custard is just about frozen, add the kit kat pieces. Serve right away or put into a tupperware and freeze for another few hours to harden completely. A weekends or two ago, we had our friend David over for dinner. David is usually in far off places like Thailand, Tajikistan or the Democratic Republic of Congo doing amazing, amazing work, and so it not often that he comes over for dinner. There really is nothing like dinner with old friends to make you feel like yourself again. Eating a meal with David is one of the best things for the soul, for my soul at least. Fortunately, for the next year or so he is stuck in Palo Alto learning lots, which means many more meals with David are in our future. I couldn’t be happier about it. Onto the food. Fall is undeniably here even in temperate San Francisco, and so we roasted a chicken and vegetables to celebrate. 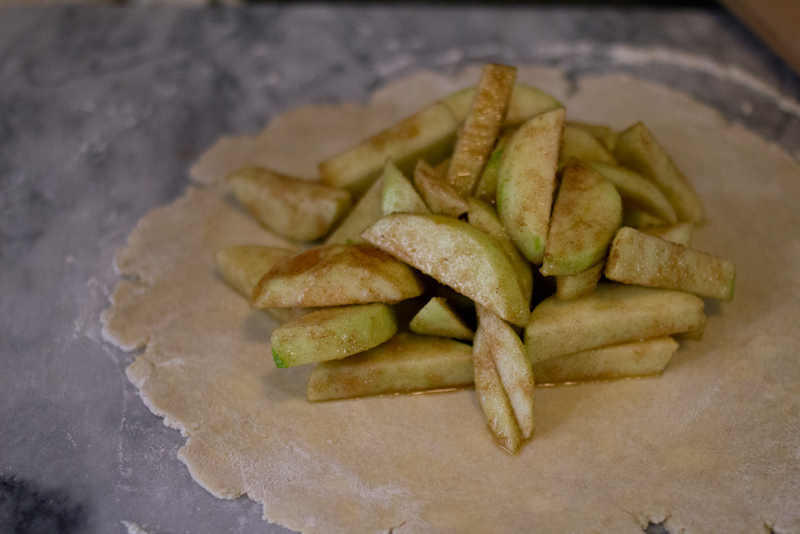 In the spirit of fall, I thought it only fitting to make an apple galette for dessert. I’m not sure why it took me so long to discover the galette. As it turns out, galettes are everything that is wonderful about pie, but with an increased crust to filling ratio—a major pro in my book—and a far less fussy preparation. Because you simply fold a sheet of pastry around the filling, they are so easy to make. 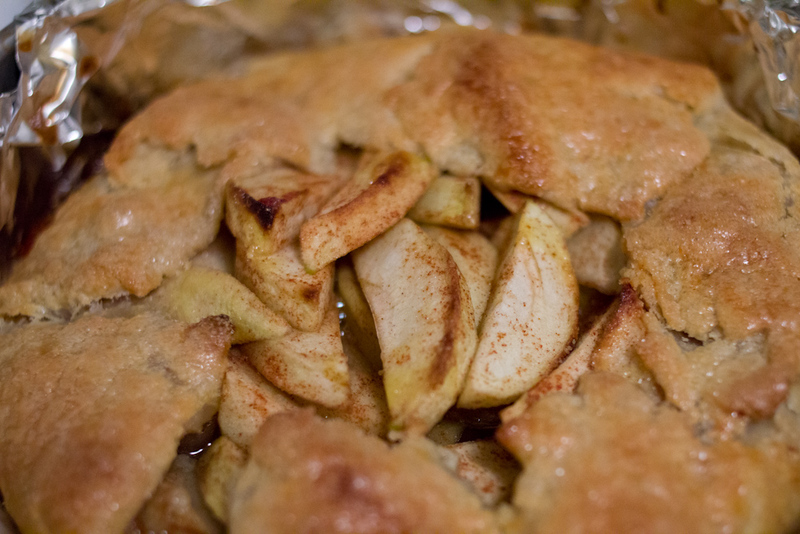 This particular apple galette turned out beautifully—rustic and delicious. I’m certain there will be many more galettes in our future, ideally eaten with David. Preheat your oven to 375° F. Line a baking pan or cookie sheet with tin foil. 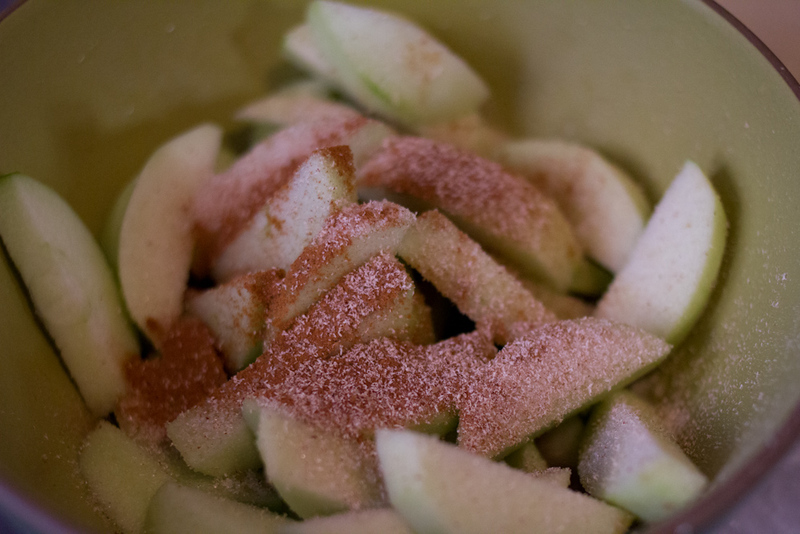 In a large bowl, combine the apples, lemon juice, sugar, flour, cinnamon, nutmeg and salt. Roll out the crust until it is about 1/4 inch thick. 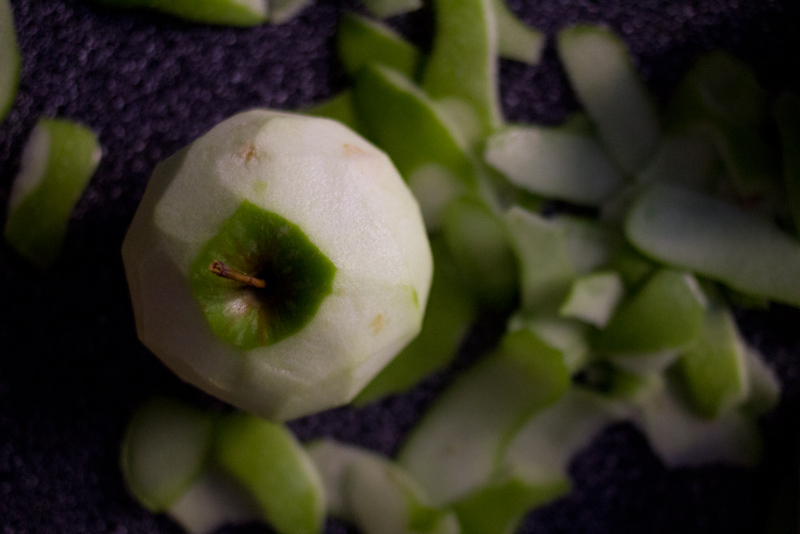 In the center of the crust, mound the apple filling. 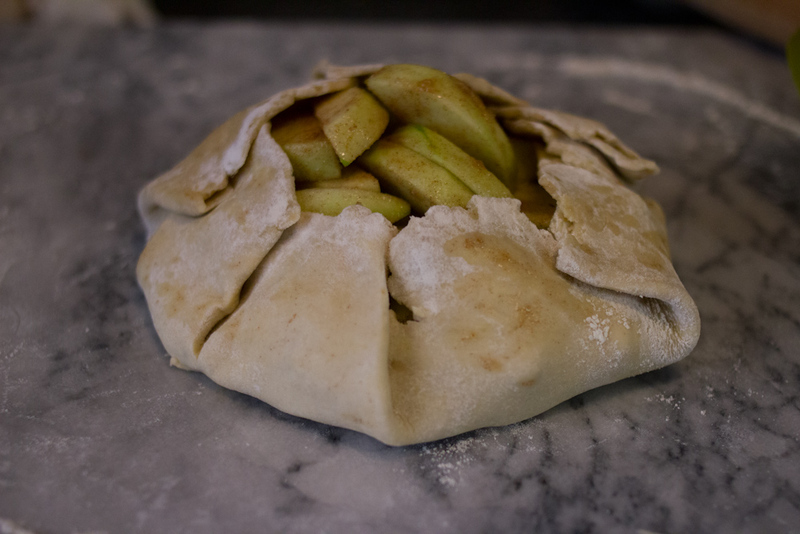 Fold the dough up around the filling, take care to make sure that there aren’t any holes in the crust where the filling could leak out. 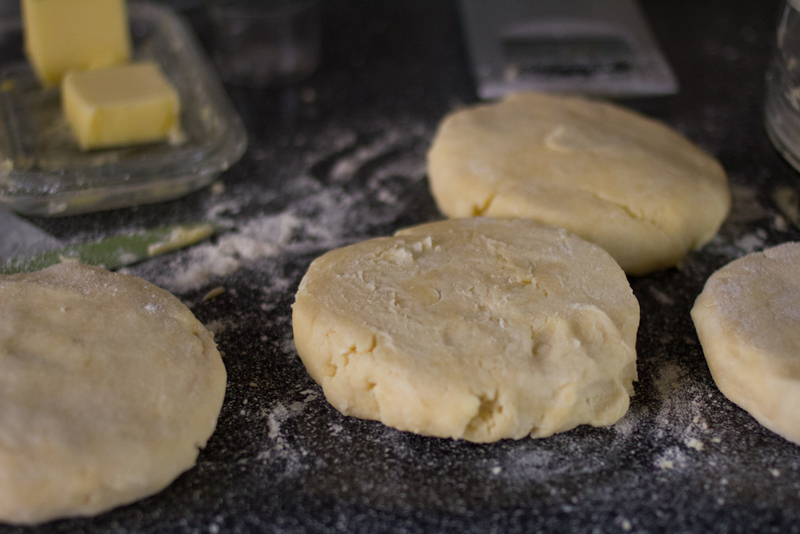 Place the galette back in the fridge for about 15 minutes for the butter in the dough to firm up. Meanwhile, whisk together the egg yolk with the cream or milk. 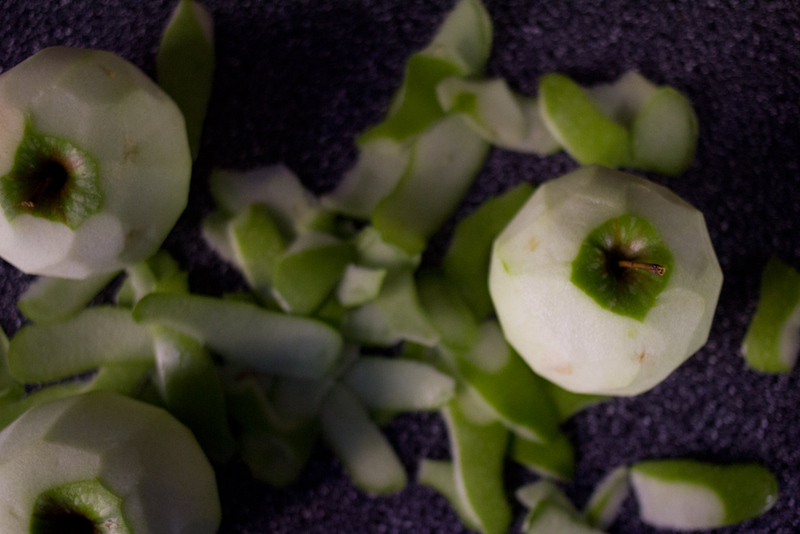 Remove the galette from the fridge and brush with the egg mixture. Sprinkle with sugar. Bake for 45 minutes to an hour, until the crust is golden brown. Serve warm with vanilla ice cream. I don’t often write stories this long, or this personal. But, I know that one day I’ll wish I had, so here goes. Be gentle. I was on my way back from work one evening in May. My phone rang, it was my mom. I talk with my mom a lot on the phone, and I could tell the second I picked up that something was wrong. She told me she had found a lump in her breast and had gone to her doctor for a scan and a biopsy. She said it was most likely nothing, probably just a cyst, and she’d know for sure in a few days. I told her that I loved her, that I was sure it was just a cyst and that she should call me as soon as she knew anything more. 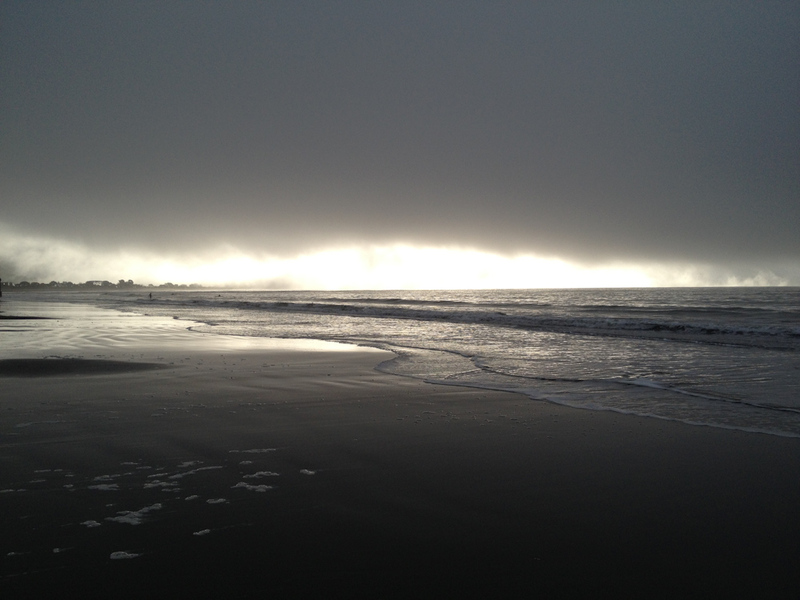 I hung up the phone and cried, sitting in traffic on Highway 101, waiting to cross the Golden Gate Bridge. The next day I was walking home from work. I was expecting a call from my mom and it came. The lump in her breast was not a benign cyst, it was cancerous. Just like the day before, I told my mom I loved her, that we would make it through this. When I hung up the phone, I cried. Screaming profanity on the the streets of my San Francisco neighborhood isn’t out of the ordinary, but that day was the first time for me. As much as I wanted to, grasping onto the possibility that this was just scare, a scare ready to fade away into foggy memory wasn’t an option anymore. My mom was diagnosed with stage two breast cancer. We were shocked and devastated. My mom was the healthiest person I knew, she never stopped moving for a second, her biggest heath complaint was the occasional headache. With the benefit of the passage of time, it’s now clear that a positive cancer diagnosis is always a shock and always devastating, regardless of who it affects. But at the time, it felt like such a personal attack, on my mom and on our family. To say that my faith in the universe was shaken would be an understatement. The irony of my mom’s diagnosis (if you can even find irony in such a thing) was that just a week earlier my mom and I had been talking about how we were so lucky, that our family was healthy and that health is something that’s easy take for granted. Though things might be tough—and it hasn’t been an easy few years for a variety of reasons—we at the very least could rely on our bodies to get up and do the things we needed them to do each day. My mom’s unexpected diagnosis felt like the universe was punishing us for speaking too soon, in the harshest possible way. With a positive cancer diagnosis, your life is no longer yours. You go from the independence of normal adult life to an onslaught of doctors appointments, scans, surgeries, treatments. My mom never visited the hospital aside from her yearly mammogram, and now she was spending most of her time there. Trust me, it’s enough to shake a person. When you’re young and healthy like my mom, the doctors waste no time. Your cancer is treated aggressively, no holds barred. This is a good thing, it means your chances of making it though the other side cancer-free are high, and obviously that is what everyone wants. But while it is happening, you’re at the complete mercy of doctors, nurses and the body that turned against you. Brutal is putting it lightly. There are more bad things about cancer than I could possibly name in a single blog post, but the worst for me was that cancer robbed me of any control. There was nothing I could do to make my mom better, there was no way I could make the coming months any less difficult, there was no way I could ensure a happy outcome. Knowing that you would do anything you could, but being powerless to meaningfully change anything, that is one of the worst things in the world. Desperate for some relief from the sadness, anger and frustration that I couldn’t seem to shake, I turned to the thing that had helped me through tough spots in the past—cooking. Cooking once again became my therapy. I’d spend entire days in the kitchen, lost in recipes, sometimes making four or five new things at once, all available counter space covered in mis en place and open cookbooks. 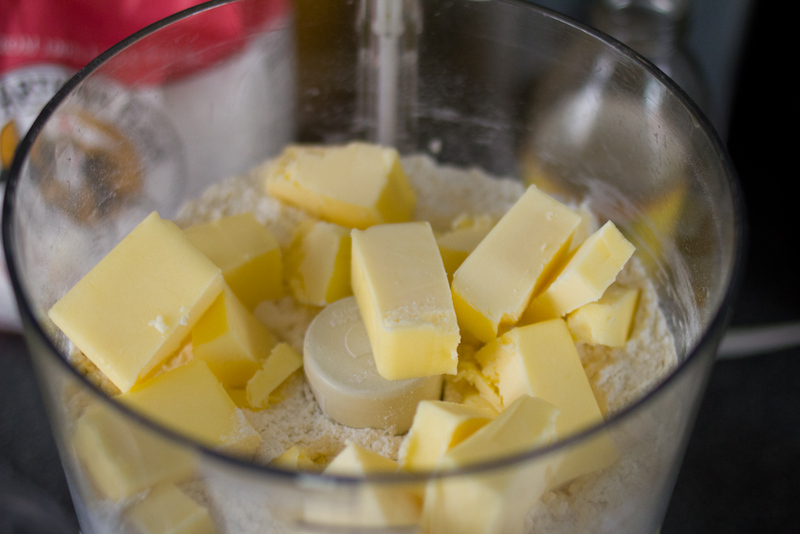 I would fall apart while mixing a dough or whirring my food processor, worrying about my mom, my family, the future. Everything felt uncertain, our lives outside of our control, and I wanted desperately for that to not be true. Still, cooking was a comfort. Hours would go by and I wouldn’t notice, absorbed in my work. It felt good. It felt constructive. 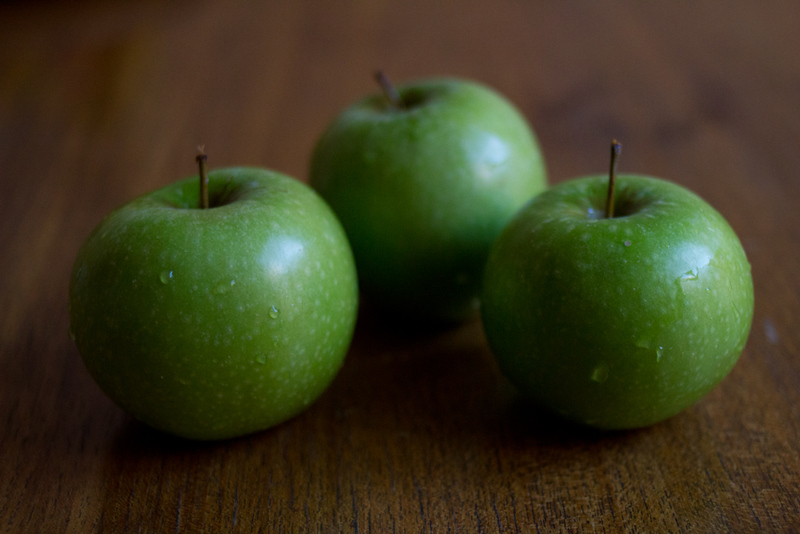 When I’d sit down and write about what I was cooking here on the blog, the worry that usually hung over me fell away. I’d get sucked into the story of the dish, transported to an alternate universe where cancer wasn’t torturing the people I loved most and we just happened to eat delicious things. It was a really lovely place to be, even if it was only for a few hours. And I don’t think I could have made it through the past few months without it. I know that by diving into my cooking and my writing over the past few months, I’ve pulled away from friends and family who were there to talk, who wanted to help me through this tough time. The thing was, I didn’t want to talk, it didn’t seem to help at all. I’m sure this hurt, and I’m sorry. Those epic days alone in my kitchen were healing, and writing recipes on this little corner of the internet helped me find some light in the darkness of the past few months, which I couldn’t seem to hold onto any other way. My mom had her final dose of chemo last Monday. Her prognosis is looking good and we’re extremely hopeful. But, if the last few months have taught us anything, it’s that this journey isn’t over yet. For the future bumps in the road, I’m grateful that I’ve got recipes in the waiting and a blog to fill.